Ever wanted to dance like Michael Jackson or a prima ballerina, but you have two left feet? Thanks to a new AI algorithm, you can now get closer to this dream – at least on video! This video shows the AI algorithm developed by researchers at the University of California, Berkeley in action. Their approach is described in the paper “Everybody Dance Now“. In this source video, the posture is detected and presented as a so-called “pose stick figure”. This posture is then transferred to the person in the target video. For this process to be temporally coherent, a unique Generative Adversarial Network (GAN) is used. Also, another GAN is used to make a face as detailed and realistic as possible. This AI algorithm opens up new possibilities for video editing. 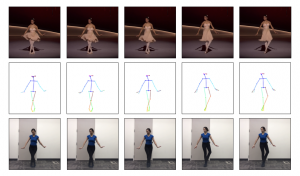 In the future, anyone can use AI algorithms to perform movements and actions on video that they are not able to do. This advancement in AI makes it almost impossible to distinguish between real and animated video. Except for the many advantages, this new technology also presents some threats. So, for example, you cannot know any more if a person on tape was doing the movement him-/herself.